Franken, Al. 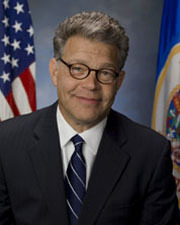 Al Franken, Giant of the Senate. New York: Twelve, 2017. ___. Im Good Enough, Im Smart Enough, and Doggone It, People like Me! : Affirmations by Stuart Smalley. New York: Dell Publishing, 1992. ___. Lies and the Lying Liars Who Tell Them: A Fair and Balanced Look at the Right. New York: Dutton, 2003. ___. Oh, the Things I Know! : A Guide to Success, or, Failing That, Happiness. New York: Dutton, 2002. ___. Rush Limbaugh Is a Big Fat Idiot and Other Observations. New York: Delacorte Press, 1996. ___. The Truth (With Jokes). New York: Dutton, 2005. ___. Why Not Me? : The Inside Story of the Making and Unmaking of the Franken Presidency. New York: Dell Publishing, 2000.